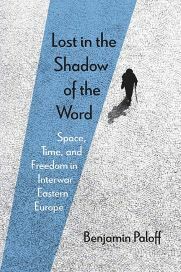 Benjamin Paloff, Lost in the Shadow of the Word: Space, Time, and Freedom in Interwar Eastern Europe. Northwestern University Press, 2016. In this brilliant, wide-ranging, and deeply original work, Benjamin Paloff analyzes the theme of intermediacy in the works and lives of some of the greatest writers of modern Polish, Russian, and Czech literature. Looking closely at shared tropes of homelessness, orphanhood, naivety, metamorphosis, immaturity, and doubling in Bruno Schultz, Andrei Platonov, Osip Mandelstam, Czeslaw Milosz, Nikolai Zabolotsky, Karel Capek, Witold Gombrowicz, and others, Paloff sees a specifically Eastern European modernism, often associated with Kafka, in which the promise of freedom in time and space, paradoxically, is equally desired and feared. Utilizing the skills of the best comparativists - fluency in several languages and literary traditions, exhaustive research into the various local scholarly traditions, and a thorough knowledge of modern philosophy and literary theory – Paloff brilliantly reveals a poetics of metaphysical unfreedom in Eastern European modernist literature. His subtle argument is a crucial contribution that will, without a doubt, resonate with scholars and readers. Alexis Peri, The War Within: Diaries from the Siege of Leningrad. Harvard University Press, 2017. 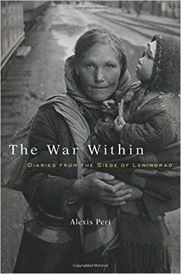 Alexis Peri’s The War Within: Diaries from the Siege of Leningrad is a fundamental study of the siege of Leningrad through the diaries of eyewitnesses. The blockade of Leningrad that lasted 872 days between 1941 and 1944 generated a number of official narratives and patriotic discourses. In her meticulous research, Peri has gathered and analyzed 125 unpublished diaries written by ordinary people during that tragic period. These testimonies relate a different kind of heroism: a story of internal battles, of dignity lost and regained, and of desperate attempts to survive against all odds. What makes Alexis Peri’s book truly stand out from the vast body of scholarship devoted to the siege of Leningrad is not only the author’s discovery of a rich trove of unstudied private documents, but also the extraordinary gap she has exposed between official Soviet siege rhetoric and brutal reality. The War Within is a nuanced examination of a human trauma delivered with utmost sensitivity and remarkable academic persuasiveness. 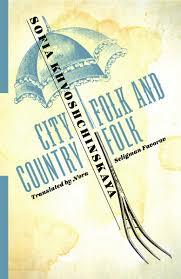 Sofia Khvoshchinskaya, City Folk and Country Folk, trans. Nora Seligman Favorov, with an introduction by Hilde Hoogenboom. Columbia University Press, 2017. The canon of nineteenth-century Russian literature in English translation has long included works that illustrate growing tensions among social strata, the impoverishment of the landed gentry following Emancipation, and the tragicomic interactions of people representing conflicting worldviews. Sofia Khvoshchinskaya’s 1863 novel City Folk and Country Folk, as its title already announces, fits squarely among likeminded works by Turgenev, Goncharov, and Saltykov-Shchedrin, and it does so with a wit and perspicacity that compare favorably to those more celebrated authors. Just as importantly, it arrives at its often sneering insights by following the lives of two noblewomen as they struggle to find their footing in a society whose notion of “reform” has barely taken the female population into consideration. Translator Nora Seligman Favorov has produced a translation that beguiles, amuses, and moves the reader while also conveying a strong sense of the rhythm and tone of the sharpest nineteenth-century prose. Assisted by an efficient, unobtrusive textual apparatus, the novel is as welcoming to the nonspecialist reader as it will be to the teacher who continues to look with dismay at the dearth of entertaining works by women on syllabi of Realist literature. Favorov has succeeded in producing a text that speaks powerfully across many divides: of time, place, gender, and—now—language. Here is a novel that will truly have readers wondering how it is that they have never before stumbled across this most sparkling gem. 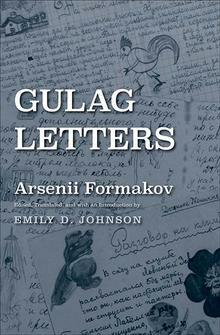 Arsenii Formakov, Gulag Letters, ed., trans., and with an introduction by Emily D. Johnson. Yale University Press, 2017. In her scrupulously researched and elegant translation of the Gulag letters of the Latvian Russian poet, novelist, and journalist, Arsenii Ivanovich Formakov (1900-1983), Emily Johnson opens a window into the terrifying world of the Soviet labor camps under Stalin. It is hard to believe that so many labor camp letters were written, posted, and delivered, and have survived, in the archives of the Hoover Institution. While the more familiar Russian prison memoirs inevitably draw on earlier memoirs, these letters to his wife, Anna Ivanovna, and their two children offer an immediacy that, for all the lacunae and usual questions about them as sources, is extraordinarily moving. The letters contain a good deal of information, for which Johnson provides context and notes. Yet the scholarly apparatus never overwhelms the whole, for Johnson has produced a translation in its own right that allows for all that must go unsaid in such letters. These particular letters, with their poems and drawings, are worth publishing and translating because they are by a professional writer. Indeed, his anti-communist journalism as the Daugavpils bureau chief for Segodnia, the most important Russian newspaper in the Baltics, ensured Formakov’s arrest in the NKVD dragnet of Russian émigré organizations after the Soviet invasion in June 1940. Formakov was twice sentenced to labor camps, from 1941 to 1947 and 1949 to 1955, and this selection of letters, carefully abridged, dates from 1944 to 1947 and early 1950s. Formakov contributed eyewitness material to Alexander Solzhenitsyn’s The Gulag Archipelago, and some of Solzhenitsyn’s letters to him from 1963 to 1965 are included in an appendix. With wide-ranging scholarship that covers the life and times of a political survivor of a treacherous history, Johnson brings this archive to life and provides a model for how to work with an unusual, rich, and complex source.